From portable water truck services and pavement striping to complete parking deck scrubbing equipment, multiple Partners in the 1-800-SWEEPER workforce have developed high value services and products that they now offer. 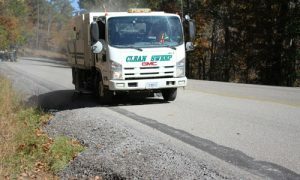 It is important for fellow power sweeping contractors to take note and determine if there may be a niche in your market to provide additional service and income opportunities throughout the year or during what might otherwise be a slower season of the year. For David McCaskill and many other Columbia, SC residents, there will be no forgetting the October 2015 flood that came as a result of Hurricane Joaquin. The original weather forecasts on Thursday, October 1st called for heavy rains and possible flooding south of the capital city, so fears were not that high in the beginning. But it just kept raining. It rained consistently all day Friday and by Saturday night the rain was still falling. 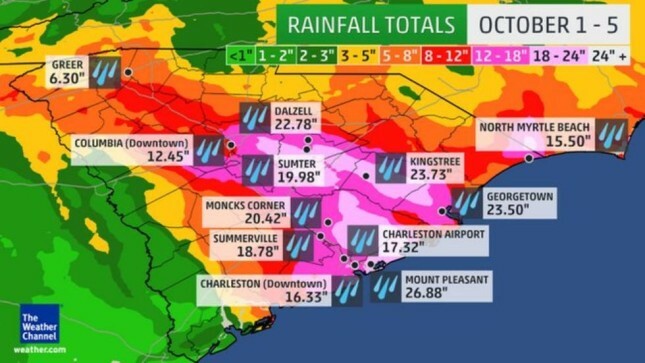 What was dubbed the “1,000-year” rain eventually dumped more than 20 inches of rain over some parts of South Carolina over a single weekend. David owns Accusweep, and has two locations in South Carolina – one in Charleston and one in Columbia where he lives. One of his clients is a former Kmart shopping center that was recently renovated into the new Rosewood Commons. Some of the anchor stores including Marshall’s and PetSmart had already moved in before the flood struck. So on Friday, just to be proactive, Accusweep installed flood barriers on the vacant spaces around the center. These structures were 4 feet tall and would be able to hold the waters back from the building. Saturday night the rain continued, and David sent his employees out to sweep parking lots as usual but asked them to drive past the new shopping center and check on it throughout the night. It was Gill’s Creek that concerned him. The creek ran in front of the Rosewood Commons strip center. Water is one of our most important natural resources and protecting that resource should be a top priority for business and individuals. There are many things that most people are aware of that impact water quality, however, some of the things that affect it the most go unnoticed. Street sweeping is, in fact, one of the best things cities and business owners can invest in for proper stormwater management and few people thinking of it this way. Consider the impact on water quality with these environmental results of street sweeping.